Search for legislators by street address and zip code. Contact information is listed clearly for easy access. Ten days ago, I wanted to call the legislators that represent me in the US House and Senate. I expected that with a quick Google search and a few clicks, I’d be able to find phone numbers for all my representatives. It wasn’t quite that simple. The official sites for the US Senate and US House of Representatives were hard to navigate, and to call all my representatives I had to visit two different sites. I finally landed on whoismyrepresentative.com, which did show me all my congressional representatives based on just my zip code — but required way more clicks than I wanted to get information for each one. I couldn’t find the kind of website I wanted, so I decided to make it myself. 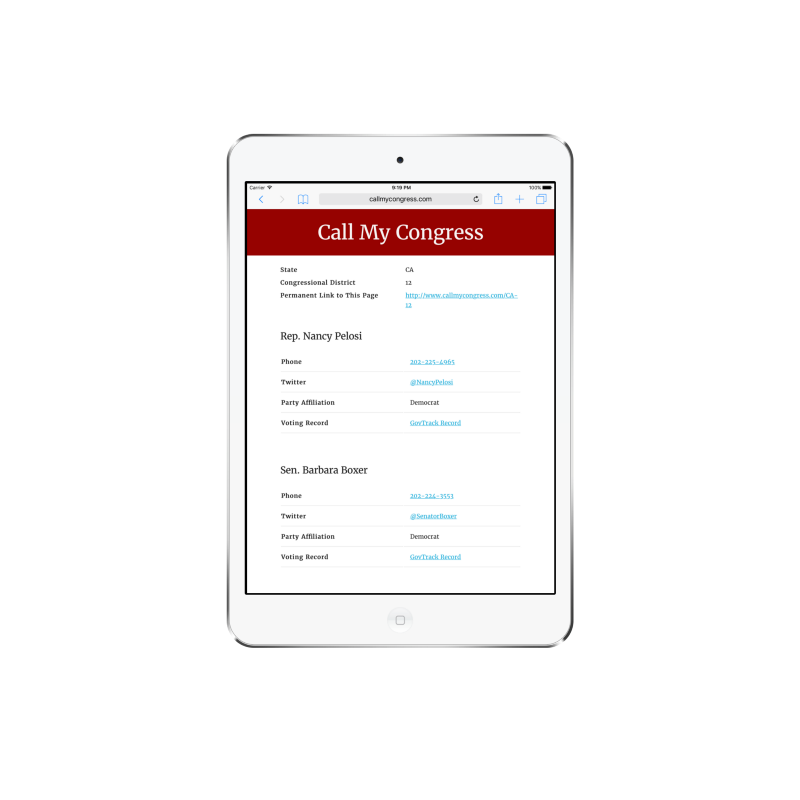 CallMyCongress.com provides quick and easy access to all the contact information for the legislators who represent you in Congress. Search for your district by street address and zip code, then see all your current representatives and senators. See contact information for your legislators and call them directly from your district page. Permalink to your district for easy reference or sharing. 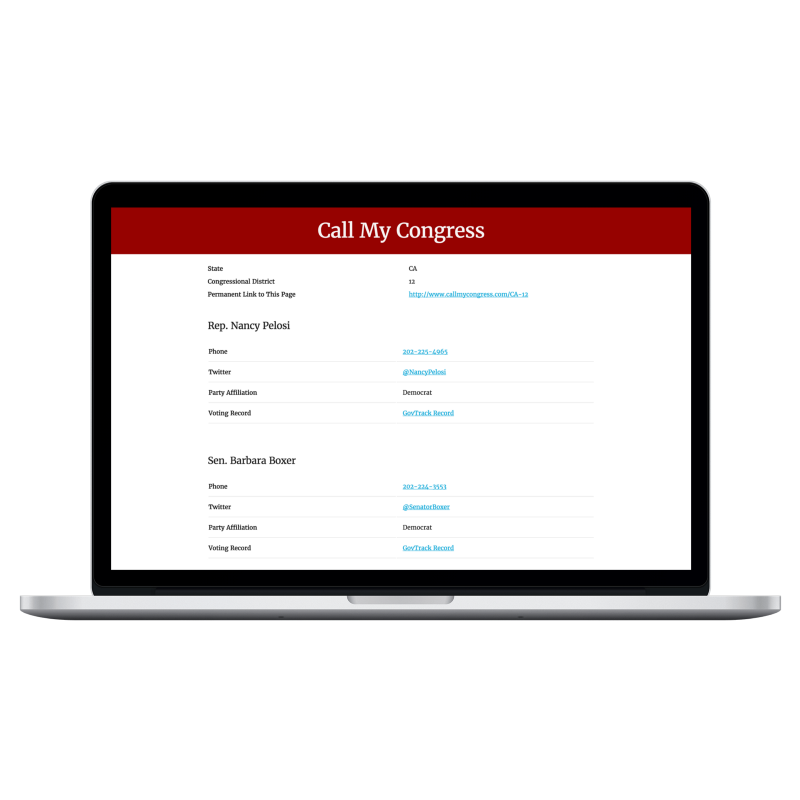 Call or tweet directly from the district page, or check your legislators’ voting records with GovTrack.us. Searching for district by zip code isn’t always accurate, as a zip code may intersect multiple Congressional districts. So CallMyCongress.com looks up congressional districts with both street address and zip code, using a free API provided by the US Census Geocoding Services. 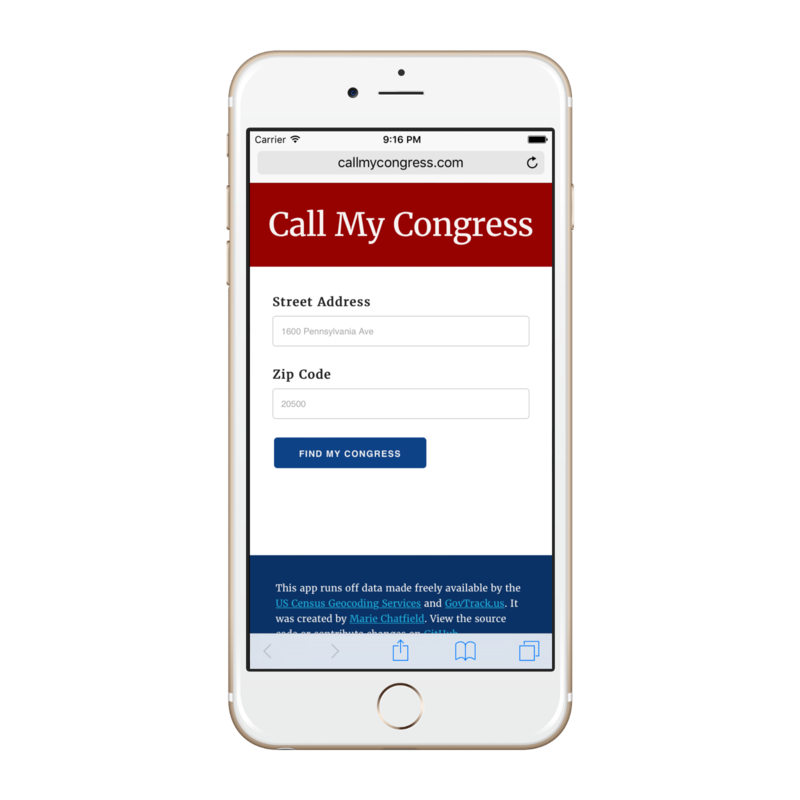 CallMyCongress.com then uses the district to find current congressional representatives and their contact information from GovTrack.us. Without these two free APIs, CallMyCongress.com could not exist. CallMyCongress.com is an open source project — you can see the source code and contribute on GitHub. Currently, the app is only available in English but I would love to add support for more languages. If you’d be interested in translating the website copy or otherwise helping with improving localization and accessibility, reach out to me or feel free to open a PR on GitHub! If you find CallMyCongress.com useful, please consider sharing it and encouraging everyone else you know to make their voice heard by contacting their congressional representatives. EDIT: Since I first released CallMyCongess.com, I’ve received some great feedback on how to make this site more secure and protect users’ information. Searching by street address is now optional — if the zip code provided covers multiple districts, you can either choose your district from a list or provide your street address to get more accurate results. All requests are now redirected to HTTPS to better protect all user data. If you have any other feedback or feature requests, open an issue on GitHub or reach out to me!